Author: Anna Frants & Cyland MediaLab. Mechanics: Sergey Komarov. Modelling: Varvara Egorova. New York, USA, and St. Petersburg, Russia. 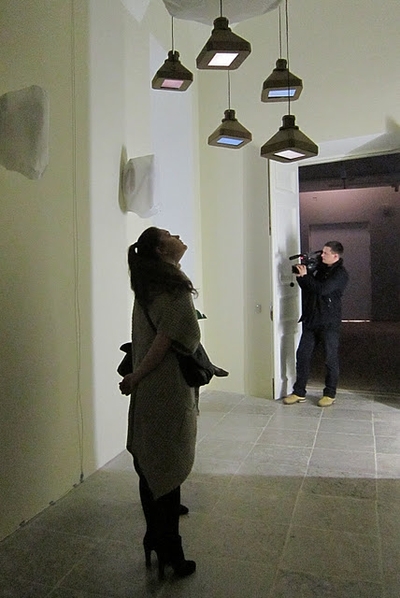 In this installation, five cardboard TV image tubes are hanging from the ceiling “face down”. A character of the video show on each screen is a drop of water that swells and falls with a characteristic sound as if from the eaves in spring. For a viewer, to watch TV “face up” is not quite natural, but it is the most natural way to observe drippings from icicles on the roof. Viewers should control an urge to step aside (because there is no real danger of getting moisture on their faces), but, instead, enjoy spying and eavesdropping on these drippings – and face the spring.